With the official opening of the Hoover Dam Bypass Bridge (Mike O'Callaghan – Pat Tillman Memorial Bridge) in October 2010, vehicles travelling on U.S. Highway 93 no longer cross Hoover Dam. Visitors to the dam must now exit US 93 at Nevada State Route 172 to reach the dam. Additionally, State Route 172 is not open to through-traffic, as the roadway on the Arizona side of the site has been closed. Vehicles can still cross the dam to visit the Arizona viewpoints and concessions, but all are required to turn around and re-enter Nevada to access Highway 93. Visitors can park in designated lots and walk across the dam for better viewing and photographic opportunities, during daylight hours only. At no time will any vehicles be allowed to stop on top of the dam. Pedestrians are prohibited from the top of the dam during hours of darkness. Originally called Boulder Dam, this engineering marvel was renamed for Herbert Hoover, the 31st president of the United States. As a conservationist, he was a strong proponent of preserving our natural resources and protecting the nation's lands from misuse, and from destruction by disastrous floods. As an engineer, he strongly supported construction of a high concrete dam on the Colorado River to control the river, and to provide irrigation water to the rich farmlands nearby, and a dependable supply of water for Southern California communities. President Hoover advocated that the Boulder Canyon Project be self-supporting, financed entirely through the sale of hydroelectric power generated at the dam. He was personally involved in the pre-construction discussions concerning the location, feasibility and safety of the dam -- a dam of unprecedented height and weight and the key to control and regulation of the Colorado River. There are hotels and motels in Boulder City, Henderson, Laughlin, Bullhead City and Las Vegas. See map to right for locations of cities. Click on the name of the city above for rates, availability and reservation online. The Hoover Dam Visitor Center is open, and you are encouraged to visit the facility. The new Discovery Tour is a self-paced tour which provides live presentations at six different locations at the top of the dam. For more information about the new Discovery Tour click here. Note: You cannot exit the dam area on the Arizona side of the dam. Must return by recrossing the dam. What vehicles CANNOT come to Hoover Dam? Vehicles carrying hazardous, combustible or flammable materials (other than the vehicle's fuel), munitions, explosives, fertilizer in excess of 40 lbs., fuel in authorized containers (gas cans, fuel drums, etc.) in excess of 25 gallons, or any material perceived to be a security risk. Please remember, these are only guidelines...inspecting officers at Hoover Dam may use their professional discretion in permitting a vehicle to cross or not. For a PDF with all the regulations click here. 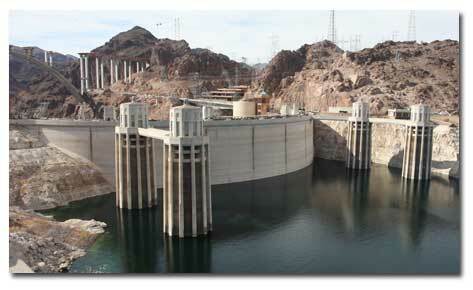 Construction of Hoover Dam began in 1931, and the last concrete was poured in 1935, two years ahead of schedule. President Franklin D. Roosevelt dedicated the dam on September 30, 1935. The power plant structures were completed in 1936, and the first generator began commercial operation in October of that year. The 17th and final generator went into commercial operation in 1961. Hoover Dam was without precedent; it was the greatest dam constructed in its day. An arch-gravity structure rising 726 feet above bedrock, Hoover is still the Western Hemisphere's highest concrete dam. It is 660 feet thick at its base, 45 feet thick at its crest, and stretches 1,244 feet across Black Canyon. There are 4.4 million cubic yards of concrete in the dam, power plant and related structures. Colorado River water irrigates more than a million acres of land in the U.S., and nearly half a million acres in Mexico. The water helps meet the municipal and industrial needs of over 14 million people. As it passes through Hoover's turbines, the water generates low-cost hydroelectric power for use in Nevada, Arizona and California. About 4 billion kilowatt-hours of energy, enough for 500,000 homes, are generated annually. Water that was once muddy is now sparkling clear in reservoirs and in stretches of the Colorado River. Hoover and other dams on the Colorado have tamed the turbulent flow, creating clean bodies of water that provide recreation for more than 10 million people each year. These waters have also provided habitats for fish and wildlife in areas that were once nearly barren. 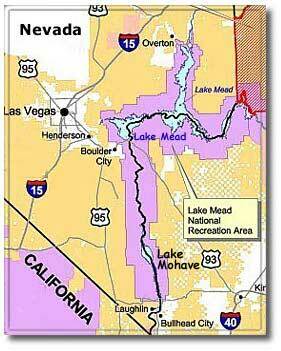 Colorado River water stored behind Hoover Dam irrigates some of America's richest farmlands. Valley and mesa lands in the warm desert climate along the river grow a wide variety of fruits, vegetables and other non-surplus crops throughout the year. Major irrigation projects which benefit from Hoover's control and regulation of the Colorado River include the Palo Verde Valley, the Colorado River Indian Reservation, the Yuma and Gila projects in Arizona, and the Imperial and Coachella valleys in California. By regulating the Colorado River, Hoover Dam assures a steady flow of municipal and industrial water to Los Angeles, San Diego and other cities in the Southwest. Phoenix, Arizona was added to the list when the Central Arizona Project began delivering water in 1985. The Tucson area began to receive project water in 1991. Several agriculture users, a number of smaller cities, and an Indian community between Phoenix and Tucson also benefit from the availability of water. Part of the hydroelectric energy generated at Hoover and Parker dams helps pump water along the Colorado River Aqueduct. The 242-mile-long aqueduct has an annual capacity of 1.212 million acre-feet (1 billion gallons) of water a day. Five pumping stations lift the water 1,617 feet over the mountains between the Colorado River and the coastal plain. Homes and industries in the Las Vegas metropolitan area receive Colorado River water from Lake Mead through the Robert B. Griffith Water Project, which was completed in 1982. Hydroelectric power is created as water rushes through turbines that activate generators. When the water has completed its task, it flows on unchanged to serve other needs. The electricity produced is clean, nonpolluting and, unlike many other forms of energy, renewable. Through the sale of power and water, a major portion of the money used to construct Reclamation projects is returned to the Federal Treasury. 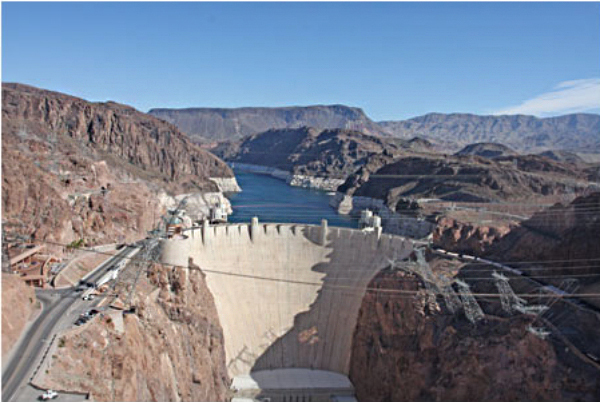 Hoover Dam's approximate $175 million cost was repaid over a 50-year period, with interest. Hoover Dam and power plant revenues from the sale of water and power have repaid approximately $260 million, including interest, to the Federal Treasury, principally from 50-year power contracts that ended May 31, 1987. Several contingencies, including $25 million allocated to flood control, will be repaid with interest over the 30-year contract period which began June 1, 1987. Water is released from Lake Mead through similar sets of diversion works in both walls of Black Canyon. The water, drawn through the intake towers, flows through pipes called penstocks, to the power plants. The penstocks can also be used to discharge water directly from the reservoir to the river below the dam. The spillways were tested in 1941 and not used again until the record high flows of 1983. Composition: 3.25 million cubic yards (2.5 million cubic meters) of concrete.